“Not a clue,” said Lindell. Ann Lindell is lying next to her lover of just a few weeks. It has been a long time since she has felt desired and the flat has been filled with talk, although talk of the present, no past or future. She knows that he is a journalist and he knows that she is a police detective, little else. Ann is just realising that she is in love – when Anders gets up and tells her he has to go and that he will be away for a week or two. On waste land beneath a viaduct lies a man's body, bludgeoned to death. There is no clue to his identity except a slip of paper with a phone number. He looks like a vagrant and a short distance away is an old site-trailer where he might have been sleeping. Ann finds it hard to concentrate during the morning meeting. She keeps thinking about Anders Brant and about their love-making. It is clear to the rest of the team that she is not paying attention. Self-conscious, she leaves the room “to make a phone call” but in reality she sits in her office trying to take stock. Her boss steps in and asks how she's doing. Ann parries his concern by suggesting that they ask at the local homeless shelter about the dead man and also suggests that it was a "wino killing a wino" but is pulled up by the reminder that they found no alcohol in the body. Finally – she cannot hide her shock when the chief tells her that the phone number found on the body is that of Anders Brant, a local journalist. He spots her reaction and asks if she knows Brant. Ann answers that they have met socially, but no – she doesn't really know him. She resolves the unspoken issue by suggesting that she works on her "cold case": a missing sixteen-year old whom no-one has seen since she left her home on a shopping trip one spring morning. The police visit to the homeless shelter gives the dead man an identity, a circle of "friends", and an ex-wife. They interview the ex-wife and she tells them that the dead man had been a sober, hard-working scaffolder until an accident left him unable to continue working. After that – everything went downhill, the drink took over and the marriage fell apart. 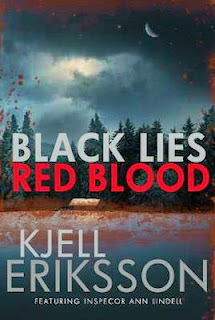 BLACK LIES, RED BLOOD is Swedish writer Kjell Eriksson's fifth "Ann Lindell" novel to be translated into English (this time by Seattle-based Paul Norlen who has also translated books by Leif GW Persson and Carin Gerhardsen). The series is set in Eriksson's native Uppsala and features detective Lindell and her police colleagues. In this story Ann's emotional life as well as her police work are under the microscope when a lover becomes a suspect in the death of a homeless man. Ann attempts to sidestep the implications of her relationship by concentrating on the case of a missing teenager. Meanwhile her lover, Anders Brant, is in Brazil, reconnecting with another love, contemplating his own feelings for Ann, and himself becoming a witness to murder. It's a tangled story of lies, impulse and death. Eriksson writes at the political sharp-end of Swedish crime fiction, perhaps more so than Henning Mankell. A one-time union activist, he insists that his novels are about the lives of "ordinary" working people as well as the homeless and the immigrant. BLACK LIES, RED BLOOD is no exception, formed from his familiar cross-section of characters' lives which intersect during a crime investigation. Occasionally Eriksson follows such characters out of the context of a central criminal plot, a technique which might leave hard-wired crime fiction fans – focused on chasing towards a whodunnit conclusion – adrift amongst his characters and regarding such diversions as red herrings. 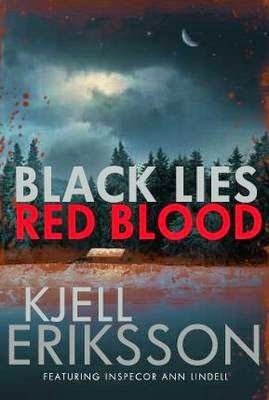 But to me these digressions are the result of Eriksson's urge for realism and social reportage and if that informs the spirit of Scandi-noir for you – then BLACK LIES, RED BLOOD is also the latest in your essential reading. Good news for me, a Kjell Eriksson fan. Hope my library has it or is getting it.